Submit your own suggestions to us for any of our products. View suggestions from other clients that we’ve made public. Vote on those public suggestions. See how many votes there are per suggestion. View a list of suggestions that you have voted on. View suggestions we are currently working on. View your personal submitted list of suggestions. In the suggestions area of your control panel you will see a number of “credits” that you have available. Every client receives 10 credits upon signing up. For each additional month you will receive one additional credit that you can use towards suggestions you’d like to vote for. And don’t fret… if you vote for something and change your mind later you can quickly and easily remove/change your votes. We recently added quite a few new suggestions for you to check out and vote on and will be updating this program much more regularly now as well. Be sure to check this out and give us your feedback! Come back often to view the newest suggestions that are awaiting your votes! If you don’t vote… we won’t know what you most want to see. So get in there and vote away! NOTE: If you only have dsIDXpress you do not have a control panel in which to vote. However, our support team can submit votes for you. Just call or email to find out what’s currently available for voting and we’ll submit those votes for you. to separate those out. Additionally, if you have more than one suggestion for one product also submit those suggestions separately to ensure that each of your suggestions get the attention they deserve. Submitted suggestions may not get approved, but rest assured all suggestions are read by the folks at the top. 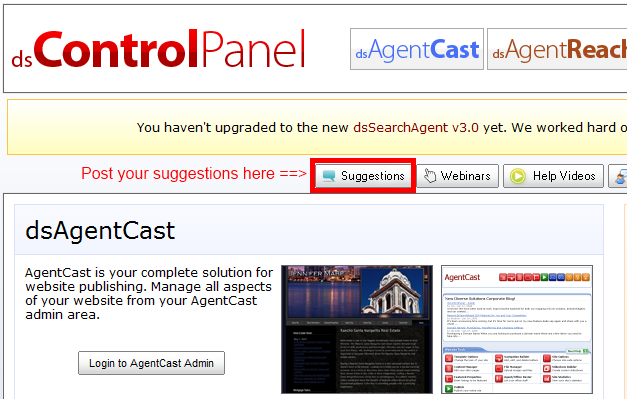 To see the status of your suggestion just log into your Control Panel and check your “My Suggestions” tab. Hey Ricardo, one problem with the Suggestions section in the control panel: only the top 16 suggestions are displayed. Therefore, new suggestions will never be seen, and never have a chance to gain votes. Hmm… I’m not entirely sure how we’re handling this so I’ll have to double-check. But as it stands right now, we’re in the process of filtering all incoming suggestions to account for duplicates and we’re manually approving them so votes are getting allocated to the right location. Anything new on this? Votes can’t be getting allocated, because new suggestions can’t even be seen by other users.